Where do you Spend Your Time – Fulfillment or Demand? Over the years, numerous time management models have been developed to help categorize and improve time allocation. Usually these models group activities by separating urgent and important initiatives from less pressing obligations. An example of a time management model is provided in Figure 1. With this framework, all activities are categorized based on how important and urgent they are. The goal is to spend the majority of one’s time in quadrants I or II, and spend as little as possible on less important activities in quadrants III and IV. The difference between the activities in Quadrant I and Quadrant II is that the activities in Quadrant I have urgent deadlines. The same work can be performed in Quadrant II, but it is planned to avoid extreme and chronic urgency. Quadrant II also includes improvement and preventative actions that reduce the overall volume of problems encountered in Quadrant I. Individuals and teams that over-commit or make numerous errors tend to spend a lot of time in Quadrant I trying to catch up. While activities in this quadrant can produce growth and success, too much time spent here will only increase the volume of work in Quadrant I. For example, a deliverable that is rushed out full of mistakes will lead to a list of urgent repairs. If those repairs are rushed, more urgent repairs will result. A good target is for 40-70% of activities to be in quadrant II. 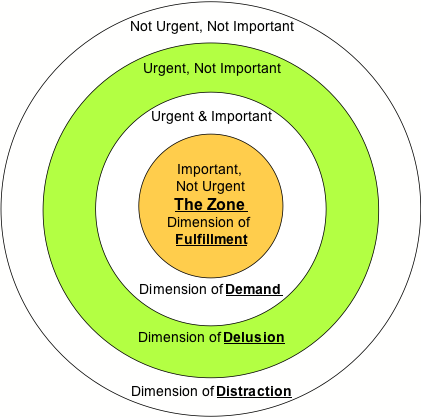 If you are spending more than 75% of your time on urgent items, you add excessive stress to your efforts and only increase the volume of Quadrant I work. One might recognize that certain aspects of their life occupy each of the quadrants. Still, how much time do you spend in Quadrant II? The premise is that the more you spend on these activities, the more you can achieve with less stress. Quadrant I should not be empty since this is where the demand on you can cause growth. Here are some examples of Quadrant II activities. When reading through them, identify some actions you can take. Perform tasks well in advance of deadlines. Estimate and plan work before committing in order to avoid being chronically over-committed. Identify similar errors (or trend) when a single significant error is found in a piece of work. Plan ahead for the next major event, especially if a similar event does not go well. Create and update a checklist so that when an important task is forgotten there is a visible reminder. Attend classes and seek a mentor. Assess and implement lessons learned. Complete one small part of the project from beginning to end and apply the lessons to the remaining work. Eliminate steps that do not impact the desired end result or add risk to the success of the activity. Automate common tasks (e.g., collection, storing, reporting and sharing of project data). Use a common organizational structure and format for project data when individuals frequently move between projects. Avoid manual note-taking which requires later transcription. Always use a PC to collect minutes and actions with a common sharing mechanism (shared web page or database). Figure 2 provides a similar model to Figure 1; however, here the categories include additional names and are grouped in the graphical layout of an archery target to remind us where to focus. Whichever representation you prefer, it is important that it be used to identify where time is spent now and to determine which actions you can take to shift your focus. In the end, one needs to be patient and make improvements incrementally and consistently.